Kudzu (Pueraria lobata), or "kuzu" as it is known in Japan, was introduced to the United States in 1876 as part of the Japanese pavilion at the Philadelphia Centennial Exposition. In Japan it is lauded for its many culinary, textile, and medicinal uses; and it gained popularity in the United States as an ornamental shade plant, well received for its fragrant flowers and adaptability. During the 1920s and 1930s, people all over the South planted kudzu seedlings, available through mail-order catalogs, around their porches and arbors. In addition, the Soil Erosion Service, established in 1933 and renamed the Soil Conservation Service in 1935, chose kudzu as the ideal cover crop to prevent erosion of southern lands. The vine became one of the chief measures for erosion control on the Tennessee Valley Authority projects. However, farmers in the South had their reservations about the difficulty of controlling kudzu and the potential of its overtaking valuable land. By 1945 it was estimated that 500,000 acres in the Southeast were covered in kudzu; by 1948 the acreage covered in Georgia alone had grown to 480,000 acres. 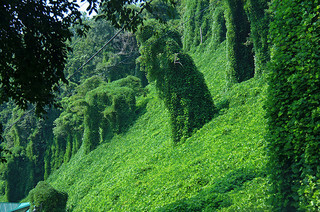 Kudzu could grow anywhere, from the lowlands of Georgia and South Carolina to the mountains of western North Carolina. By 1955 people had grown irritated with the vine's relentless appetite for more space; as one southerner put it, "It was like discovering Ole Blue was a chicken killer." The poet James Dickey called kudzu "a vegetal form of cancer." During the 1960s several programs for eradication were started. By 1970 the estimated area of land covered by kudzu was 85,000 acres, just 17 percent of the estimated 500,000 covered in the years 1945-50. However, kudzu still runs rampant in the forests of the South, including those of North Carolina. The vine invades forests, climbing trees and smothering them by cutting off sunlight. Kudzu now grows more prolifically in the Deep South than in any other part of the world, and what was once hailed as an "agricultural miracle" is now more widely considered to be a "green menace." While many yearn to eradicate kudzu, others argue that creative uses must be found for the persistent vine. There are still those who praise kudzu for its use in erosion control and as a livestock feed. Others propose that kudzu be planted in barrels on top of buildings so that the vine can grow down, covering the building and serving as a natural coolant. Health food stores sell kudzu powder imported from Japan for culinary and medicinal use. Researchers at Vanderbilt University are looking into using the vines and leaves as a source of fuel and the roots as a fermentation substrate for the production of baker's yeast and ethanol fuel. Alcoholism researchers at the University of North Carolina at Chapel Hill and Research Triangle Park are studying a Chinese hangover remedy that includes kudzu. Kudzu also gives its names to various pieces of southern culture. For example, the Winston-Salem grassroots organization Carolina Music Ways Music Heritage Resource Group, which seeks to promote the musical traditions of the northwest Piedmont, was originally called Kudzu. In addition, Kudzu, a popular, nationally syndicated comic strip created by Greensboro native Doug Marlette, is set in the fictional North Carolina town Bypass and deals with the experiences of the teenage dreamer Kudzu Dubose. Despite the problems it causes, kudzu has gained a permanent place in the southern landscape and culture. William Shurtleff and Akiko Aoyagi, The Book of Kudzu: A Culinary and Healing Guide (1977). Angela Spivey, "Sobering Effects from the Lowly Kudzu," Endeavors 12 (April 1996). Kudzu covering the land in Bryson City, North Carolina. Image courtesy of Flickr user Francisco Daum. Available from http://www.flickr.com/photos/franciscodaum/6072079624/ (accessed August 22, 2012).